So much has been written regarding the Battle of Waterloo and the campaign of 1815 that readers would be forgiven for thinking that there was nothing else to say. Incredibly, despite the millions of words published on this subject over the last two hundred years, this belief is far from correct. For far too long thousands of pages of primary source material from hundreds of eyewitnesses to the whirlwind events of 1815 have lain virtually ignored in the archives of Europe until the last decade, when a dedicated group of individuals, including most notably John Franklin, Erwin Muilwijk and myself, have published a huge mass of this material, much for the very first time in the English language. This has forced every historian to seriously re-evaluate their understanding of this campaign and has shown that, the story of the battle and campaign which we have grown up with has in many respects been misinterpreted or is quite simply wrong. As part of this new understanding, I have recently published a revised history of the Battle and campaign of Waterloo, incorporating all of this new evidence, discovered throughout Europe, the Commonwealth and America, entitled Waterloo, Myth and Reality. A very significant new source for this book was the voluminous papers of Lieutenant General Sir Henry Clinton, the son of the Sir Henry Clinton who commanded British forces during the War of American Independence and brother to Lieutenant General Sir William Henry Clinton, perhaps most unfairly known for the debacle in Eastern Spain in 1814. The Clinton family clearly threw little away and there are literally hundreds of thousands of pages of documents written to or from Sir Henry Clinton and his brother William alone, preserved in two significant archives. I have been aware for a few years, of the no less than 130 archive boxes, literally crammed with papers relating to the Clinton brothers, lying virtually ignored and un-catalogued at the John Rylands Library in Manchester. A few years ago, I spent many months regularly travelling to this library to search every single box for relevant material regarding the Waterloo campaign and photographed each individual page so that I could process all of this primary evidence at a more leisurely pace at my home in Cardiff. I completed this monumental task, to discover that I had over six thousand photographs of documents simply relating to Sir Henry Clinton during his time in Belgium in 1814-15 and during the subsequent Occupation of France until 1818. It soon became clear, however, that this was not the end of the trail. For I discovered that the Beinecke Library at Yale University also held papers regarding not only from Sir Henry Clinton senior, but also much material regarding his two sons. It would seem that when the Clinton papers were auctioned in 1958, the collection was unfortunately split between these two major archives. With some perseverance and a great deal of good will shown by the staff at the Beinecke Library I was able to obtain photographs of over fifty more letters, two books of Inspection reports and his daily diary, contained in four leather bound booklets all of which Henry Clinton wrote in the period 1814-16. They were also able to provide superb images of a number of maps relevant to the campaign which had actually been owned by Henry Clinton. With a total of over ten thousand images of primary documents relating to this campaign, this has clearly become a major task, but one I have readily undertaken because of the breadth of the material and the unique insight this gives us of the commanders, units involved and their actions in this campaign. Sir Henry Clinton was a very experienced officer, highly regarded by the Duke of Wellington and was uniquely placed to view the entire campaign and the build up to it. He was appointed to serve as second in command, to the relatively inexperienced Prince of Orange, who commanded the British army in Belgium alongside his own forces in the latter half of 1814. Henry was primarily engaged in the regular inspection of all of the troops stationed in Belgium, from the remnants of the British units which had so recently failed to capture the fortress of Bergen op Zoom, together with the vast majority of the King’s German Legion who were in fear of being disbanded as part of the peace dividend; the new Hanoverian levies recently sent into Belgium and of course, not least, the Dutch and Belgian units of the fledgling Netherlands army. His honest reports regarding the abilities of the officers, the training and equipment of their men and the honest assessment of their failings are invaluable, allowing us to understand the true quality of this small army before news of the escape of Napoleon suddenly brought preparations for war back to the fore. With this sudden change of events, Henry Clinton was again perfectly placed to be fully conversant with all of the works that were begun to make the Belgian fortresses secure from a coup de main and the efforts to bolster the army significantly. Orders were sent for every available regiment to proceed from both Britain and Canada, and masses of recruits were sent from the depot battalions at home to bolster significantly the undermanned sister battalions stationed in Belgium. He was also perfectly placed to discuss the Prince of Orange’s plans for defence and to make suggestions as to how these troops could be improved. Henry Clinton was delighted to hear that his old commander, the Duke of Wellington was to take command of this massively increased army in Belgium and that it was to be completely reorganised. He was appointed on 11 April 1815 to command the 2nd Division within this new organisation and with which he served throughout the ensuing campaign and he has left an frank and honest assessment of both his troops abilities and achievements. This is the real point at which this story of the 2nd Division begins. This study of the 2nd Division in the Waterloo campaign builds on all of the information available regarding the troops that formed it and their subsequent actions during the campaign. This division comprised troops of the British army, the King’s German Legion and of the newly raised Hanoverian levies and a true assessment of their worth and capabilities can now finally be made. The division was stationed too far away to be involved in the Battle of Quatre Bras and only partially in the subsequent retreat, but was fully involved in the Battle of Waterloo, although most historians play down their role significantly, with one notable exception. The role of the division in the battle is largely untold, with nothing said regarding their important roles in protecting Wellington’s right wing, their part in the defeat of the great cavalry attacks or their invaluable support in the defence of Hougoumont, which may have collapsed without their aid. 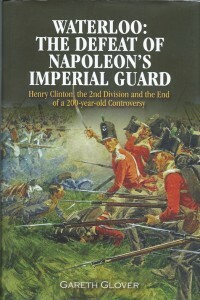 It is only with the final crisis of the battle, that Clinton’s men suddenly come to the fore in the history of the battle, when his British light infantry brigade, or more specifically the 52nd Foot are praised for their flank attack on the Imperial Guard and their leading of the subsequent final advance. But even here their laurels are contested with the British Guards battalions claiming at least an equal part, if not the lion’s share of the defeat of the Imperial Guard. Their part is therefore far from clear and it is high time that their achievements were rightly celebrated, unclouded by confusing counter claims. Recently, some historians, particularly led by Nigel Sale, have argued strongly that the exploits of the 52nd in defeating the Imperial Guard have been largely ignored and because their exploits were omitted from Wellington’s despatch, consequently a conspiracy theory has emerged. There is much sympathy for their claim regarding the granting of the laurels of Waterloo – including from this author as will be seen. But it will also become clear that the cause for this omission and the real culprit of any conspiracy, if indeed there ever was one, was certainly not the Duke. It is therefore clear that a full and unbiased account of the actions of Sir Henry Clinton’s 2nd Division at Waterloo is now badly overdue and will provide the first in depth, honest appraisal of Wellington’s troops at Waterloo and of their real exploits. Finally the division’s prominent part in the advance and capture of Paris and the subsequent Occupation of France has never been told with any real authority until now. Even as early as 24 August 1815 the formation of the division began to alter radically and it changed even further in the October when the Army of Occupation of France was formed, which was to remain there for three years until the end of 1818. Therefore the main focus of this book will be on the 2nd Division as it actually was for a mere four months, but what a four months that was!